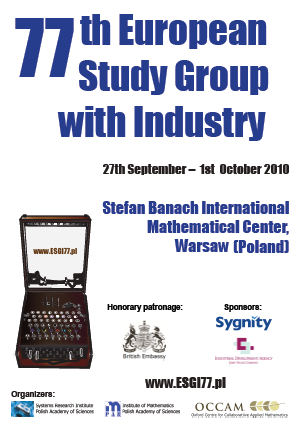 From Monday 27th September to Friday 1st October 2010, the 77th European Study Group with Industry will be held for the first time in Warsaw, Poland. The organizers are two institutes of the Polish Academy of Sciences: the Systems Research Institute and the Institute of Mathematics. The idea of Study Groups, initiated in Oxford University in 1968, has long traditions to link academic mathematicians and industry. Following the spirit of industrial mathematics, it utilizes the strict logical reasoning and deep theoretical knowledge to solve demanding, real-life industrial problems. Study Groups with Industry have been held annually for over 40 years in UK, now in fact are implemented with success in other countries like USA, Canada, China, Denmark, the Netherlands or Australia. Beginning with this year, as the part of European series of Study Groups, it is held also in Poland.